Moving your enterprise to the Cloud has never been simpler, with Web based solutions for Projects, IT and HR that offer simple migration, codeless configuration, process mapping, and user-customizable experience that make data discovery and drill-down almost effortless. Contact us today to learn more about what TrackerSuite.Net 4.0 can offer your organization. 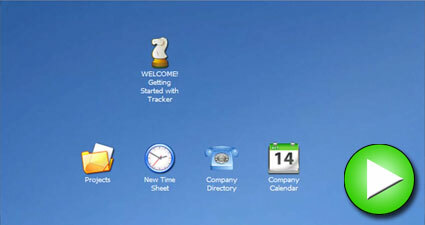 Redesigned from the ground up to provide faster solutions, better business configuration and a new, powerful user experience, TrackerSuite.Net 4.0 empowers both the organizations it serves and the users that leverage it with modules for Project Portfolio and IT Management, Time and Billing, Purchasing, Invoicing, CRM and HR. We are pleased to offer two demonstration sites showcasing how TrackerSuite.Net 4.0 can serve different organizations. Register for immediate access to our PMO demonstration to learn how TrackerSuite.Net 4.0 can simplify project portfolio management, regulate the project request process and support decision makers. Register for immediate access to our IT demonstration to learn how TrackerSuite.Net 4.0 can empower IT departments by integrating Project Management and Help Desk services. New record level security model and configuration. New forms definition allowing organizations to customize forms, their tabs and fields, as well as controlling who can see and edit specific fields. 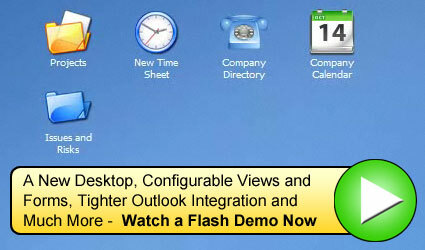 New view technology that allows drag and drop columns, filters, and the ability to publish custom views. New desktop that users can customize to their individual needs. A new calendar interface that simplifies task tracking and workload reviews for managers and users alike. Ability to search attachment content. A new user interface for documents makes it easier to review their status and history. Threaded email discussions for Customers, Support Tickets, Projects and Tasks. 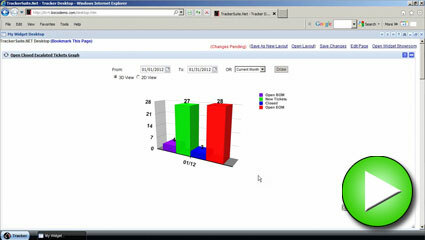 New, easy to use Resource Utilization Graphs. 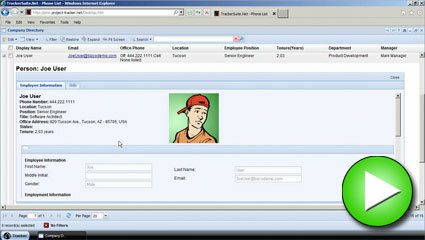 New security provides role-based access as to who can read and who can edit specific Personnel files. Design and publish your own views of Project or Task data. 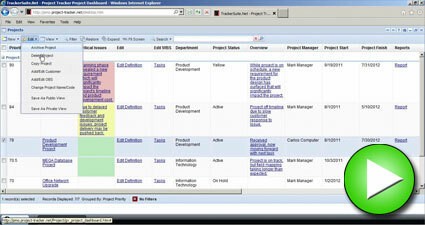 Improved Web Based Gantt Chart reports. Improved Project and Task Dashboards. Drill down and across Project hours and financial information. Improved security to control who can see and who can edit Project information. Easily update Web Timesheets from Support Tickets and Tasks. 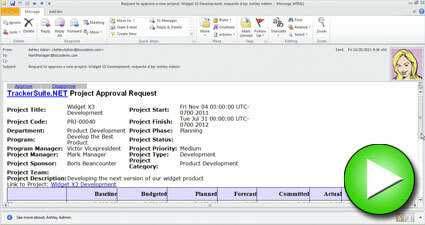 Ability to send Timesheet for approval to Project Managers. Ability to add attachments to Timesheets. Improved time compliance with drill down reporting. Define multiple formats for Web based Purchase Orders, and terms and conditions using our new work or PDF export function. Better visibility and drill down to financials to see real time information on baseline, budget, committed and actual data. New Invoicing module facilitates Professional Services Automation, with simplified creation, review and approval of Invoices. Redesigned Support Ticket for improved usability. Email threading/discussion to easily gather more information about the Support Ticket. Approval option for new or out of scope requests. IT Change Management to facilitate the request, approval, testing and deployment of IT changes. Easier Contract Management, allowing managers and Administrators to see the total value of contracts and when they expire. Improved ticklers simplify activity scheduling and management. Automation Centre is a leading provider of advanced team collaboration software solutions for companies and organizations of all sizes. Automation Centre's primary products include TrackerSuite(TM) and TrackerOffice(TM), providing exceptional simplicity and ease-of-use through their integration with Lotus Notes/Domino and Microsoft Outlook/Exchange; and TrackerSuite.Net, leveraging the power of cloud computing to deliver access and collaboration via a virtual office interface. The company is a Premier Business Partner with Lotus, an IBM Business Partner, and has been named to the Microsoft Exchange, Microsoft Project, and Microsoft Certified Partner programs. For more information about Automation Centre visit www.Acentre.com, www.TrackerSuite.com, www.TrackerOffice.com or www.TrackerSuite.Net. TrackerSuite.Net is a trademark of Automation Centre, LC. All other trademarks and/or registered trademarks are the property of their respective owners.